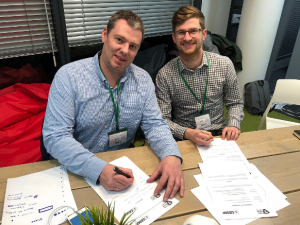 Copenhagen/Edinburgh, 5th January 2018 – Geoop has signed a memorandum of understanding with Townrock Energy to jointly promote green energy, develop projects and support initiatives in Britain regarding geothermal energy. A special focus will be on geothermal heat projects for district heating or similar larger consumer bases. Geoop has been looking for geothermal energy projects with solid economic cases that will support the long-term visions of changing heat energy supplies to a low carbon source. Lars Andersen, CEO of Geoop Aps commented “With Townrock Energy we have found a partner who has the same mindset as us and has worked with geothermal energy for a long time. They have an in-depth knowledge of the local business environment both with regards to regulatory, technical and commercial requirements. At Geoop we see the potential of the British sector, and with Townrock Energy, we have complementary skill sets for a successful collaboration. We are looking to develop and invest in projects where we can see a determination to advance the green agenda”. The two companies have been speaking in-depth over the last couple of years after making contact through conference events including All-Energy and the Geological Society’s UK Geothermal Symposium, both chaired by Townrock Energy. David Townsend, CEO of Townrock Energy added: “We have seen the need to bring competence to the Scottish British marketplace, and we are excited to start promoting our combined offering to clients. We have with Geoop the possibility to propose projects where we include the full lifecycle – from project inception and definition to engineering and financing, over drilling and construction, to production and maintenance of facilities for the duration of their technical lifecycle”. About Geoop A professional operating company, creating green energy from geothermal resources. Geoop promotes geothermal energy as part of the green agenda and develops geothermal resources on the same scale as wind energy. Geoop aspires to become the operator of geothermal projects for district heating companies, resulting in greater operating efficiency and cost reduction.